As the energy of the holiday season fills our hearts, bold astrological forces are at work in the night sky. December’s Full Cold Moon, Winter Solstice, and the Ursid meteor shower have stargazers marveling at the mystery and magic of the universe. Lunar beauty illuminates the land as candles and merry lights fill our homes. One does not need a personalized invitation or excessive means to participate in this season of merriment. Giving and receiving kind words, after all, costs nothing. A thoughtful card, a gift gathered in nature, anything handcrafted with creativity, these are often more memorable than something off the shelf. Observing the close of the year and ringing in 2019, we dream of a grand event. As a global SYI family, we invite each of you to set a festive table, invite as many as the table can seat, and together we will hold a beautiful, virtual celebration. Light candles, turn on music, prepare something healing to eat, a warming beverage, enough to share. And with an ambiance of love, together we will watch hearts open and spirits soar. We thank you for walking this path together with us. We offer gratitude for all the ways your practice inspires others. We bow humbly in the knowledge of your goodness and charity. May you have joy and may you feel love. 1) Sauté the Onions and Garlic in the coconut oil for 5 minutes on medium heat. 2) Transfer half of that mixture to a blender and blend with Cashews/macadamias, coconut milk, Nutritional Yeast, and salt/pepper. 3) In the meantime, add the artichoke hearts and spinach/chard to the remaining Onions and garlic and sauté for 5-10 more minutes. 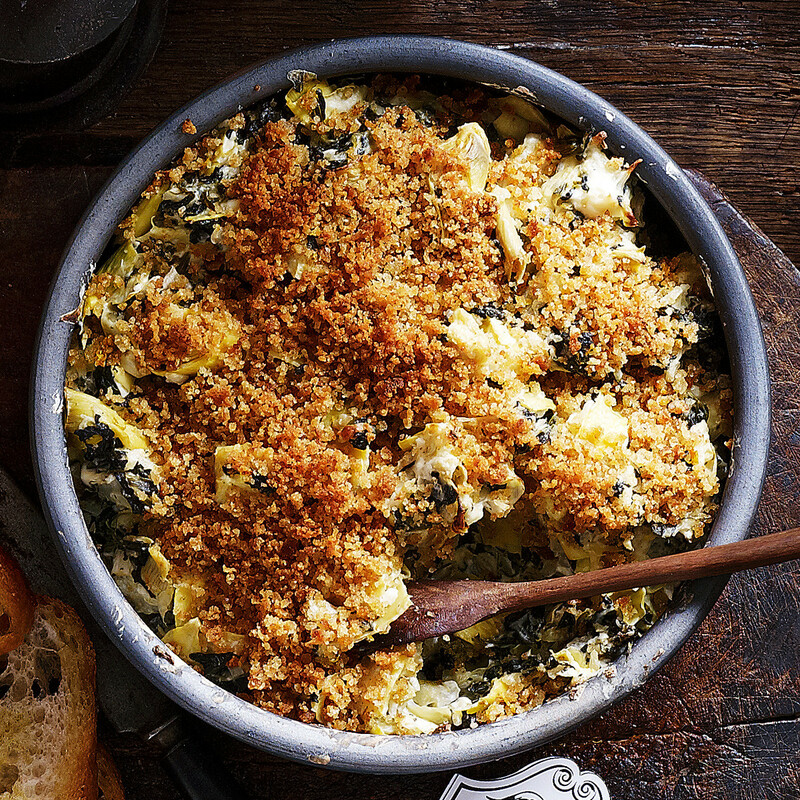 5) Now, transfer the entire mixture to a pan or cast iron skillet of your choice for the oven. Add the gluten-free vegan breadcrumbs and Earth Balance/coconut oil, and bake for 10 minutes. Congrats Peru 200 hour Graduates! Congrats Guatemala 200 hour Graduates! Check out our new SYI Podcast on soundcloud! I don’t want you just to eat and be content. Thank you for taking a moment to pause and reflect with us. For our SYI family in the US, November’s full moon will rise at the end of the Thanksgiving holiday. 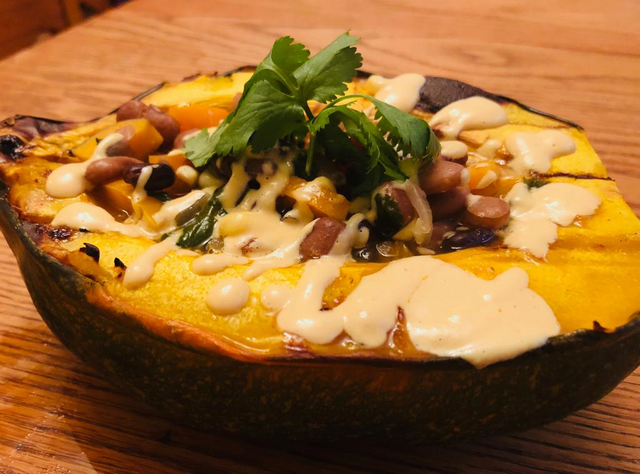 Celebrated by gathering together with loved ones over a bountiful meal, it is an opportunity to reflect on the gifts of the earth and the joy of community. While observing holidays and other rituals, the most generous gift we can offer is that of presence. By setting a sincere intention to stay in the moment, we are able to more fully show up as the loving soul we wish to embody. In preparation for the occasion, find a quiet moment to reflect, to connect with the season, to still the mind. Allow feelings of anxiety as well as those of joyful anticipation, to simply be. Throughout the day, reconnect with the breath and experience a grounding feeling. Gathering around food, we are thankful for its comfort and nourishment. Can we extend that gratitude to the farmers, the fields, the soil, the sun and all things so intimately connected to our rich lives? We invite you to offer a blessing, compose a poem, or voice simple words of thanks for others to hear. A day of celebration spent in presence, with a heart full of love, this is the practice and the gift of a life well lived. Wishing each of you, and all beings on earth, bountiful peace and contentment. In its highest form, yoga is a practice for your body and your mind. 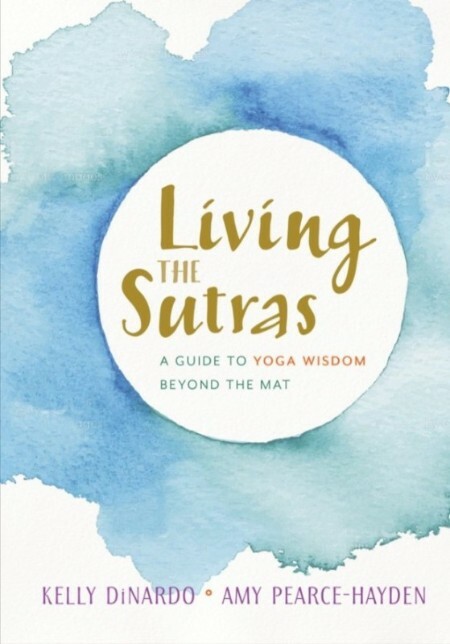 Living the Sutras brings the wisdom of classical yoga philosophy into your life in an accessible and relevant way. The Yoga Sutras, a foundational text of yoga philosophy and practice, written by the guru Patanjali over two thousand years ago, are made up of 196 aphorisms that offer potent teachings on how to deal with loss and pain, and guidance on how to lead a healthy and fulfilling life. “The discoveries made on this journey were shared collectively in a community of souls, so divinely aligned. We soul searched together, sharing our innermost vulnerabilities, opening up, connecting on a new level. Becoming comfortable in discomfort, and learning how to embody raw self expression. 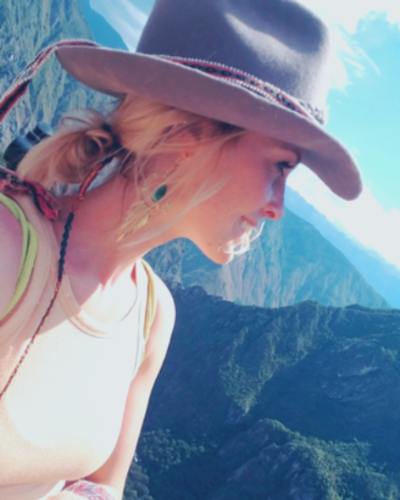 We melted into the sway of Mother Earth’s perfect rhythms as we stilled our morning minds to each sunrise.” Read more of Tori’s story here. For the crust: Place all ingredients in a food processor or blender, and process until sticky but not wet. Spread on a piece of parchment paper, in a pan of your choice. Place in freezer for 30 minutes. For the Filling: Place all ingredients in a blender and blend until smooth. Take crust out of the freezer, layer the filling on the crust. For the Pumpkin swirl: Blend all ingredients. 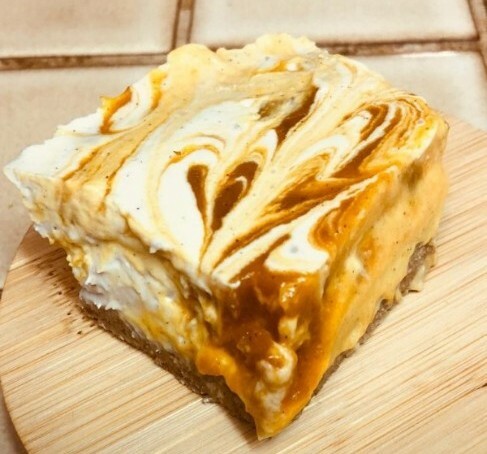 Place small dollops of the pumpkin swirl on the cheesecake filling and use a chopstick to gently swirl them together. Make art!! Place in freezer for a minimum of 2 hours or overnight. Take out 30 minutes before serving. ENJOY!!! Gratitude isn’t necessarily just about being grateful for all that you have, it is also about being grateful for all that you are. When we are able to tap into this deep appreciation for the miraculous and abundant nature of simply existing, life becomes much more light-hearted, joyful and liberated. Yoga teaches us to simplify. The easiest way to access this simplicity is through our breath. As we slow down and tune in, we can become awestruck by the simple miracle of breathing. We can become divinely astounded by how much goes into allowing our bodies and minds to function as they do. We can become blown away by our ability to walk and talk and conversate. When we are connected in this way, the petty dramas of life begin to fade away. This humble yet profound acknowledgment allows us to come back to what is truly important in this life.When we are able to recognize how amazing we are on this cellular and spiritual level, we can also notice how beautifully complex everyone and everything else is around us. Other people are a direct reflection of ourselves and oneness becomes a fact of life. 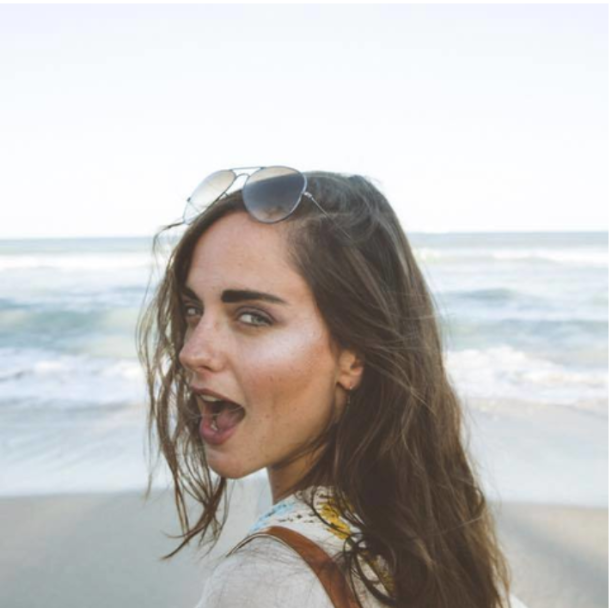 This type of gratitude shifts not only how we see ourselves, but also how we relate to and connect to the world around us. 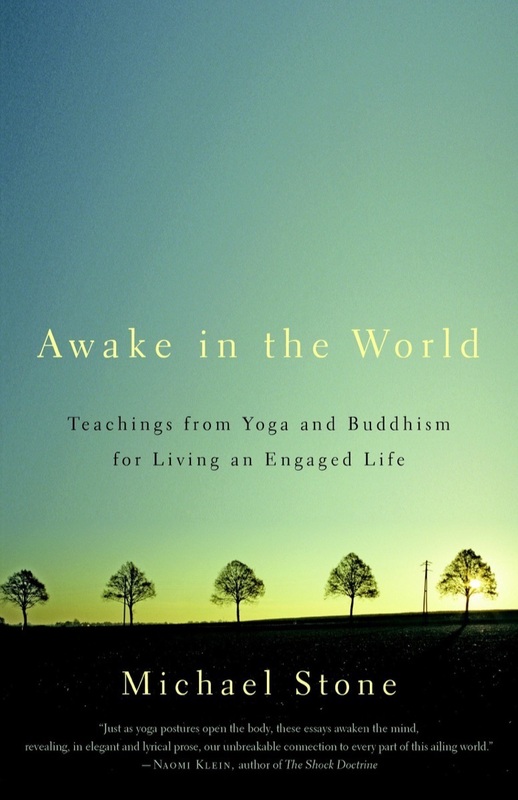 As we learn from the yoga sutras – yoga helps us tame the fluctuations of the mind. We are often flooded with ideas, ideals, conditioning, and structuring. Only once we truly let go of these constructs and concepts can we step into this deeper appreciation for all that we are. Often what holds us back from dwelling in gratitude is imaginary limitations in the mind. Release unnecessary thought patterns, desires, and attachments. Remember that you already have everything that you need and that all of your answers are within. Simplify your relationship with your life. Open up to the unbelievable and incredible human miracle that you are. As we enter this season of celebrating, gathering, giving, and receiving – see if you can redefine gratitude for yourself. This word ‘gratitude’ has so much depth and resonance but it is often thrown around without acknowledging its true power. To deepen our relationship with gratitude is the greatest gift we can give ourselves and others this holiday season. I invite you to become blown away by the miracles that are all around you. With grace and excitement begin to notice how everything and everyone around you is divinely interconnected. Marvel at your loved ones with wonderment for your kindred alliance, companionship, connection and love. With the recognition of interdependence and willingness to open to the miraculous nature of all things, you will naturally and more easily live with a full heart and deep-rooted appreciation for all that you are and all that there is. This is gratitude. Each month, the new moon completely disappears from sight when the moon and the sun line up above the earth. Though hidden from view in the dark sky, we do not doubt its presence. The moon, earth and sun interplay in perfect synchronicity. We trust this with a certainty. And yet for most of us, the nature of impermanence is a far more prevalent feeling. Each moment arises and passes, never repeating, always new. Life’s constant change may lead to feelings of gripping, of resisting, or fear. We see examples of some so afraid of difference, they choose to support systems of power that limit and neglect others in an attempt to maintain a status quo. For a moment, recall a night spent inside by a glowing fire, watching as the logs slowly burn to cinder and ash. With the body and spirit warm, the fire’s eventual dimming is not too difficult to accept. 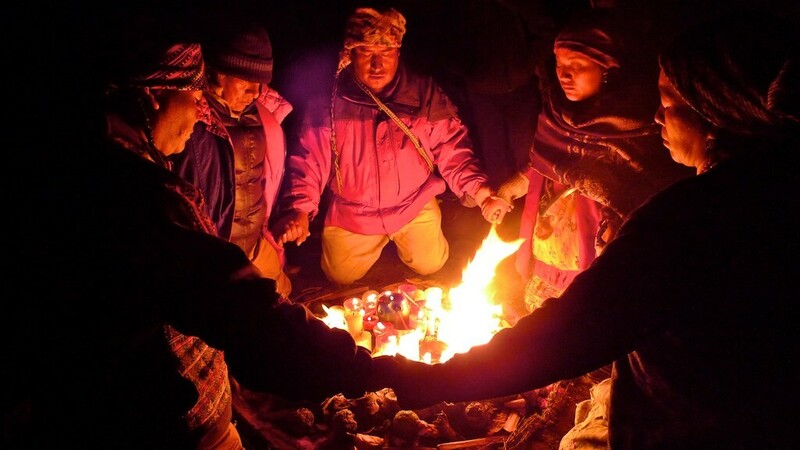 When all are welcome to find warmth at the fire, when the circle is enlarged to make room for the stories, laughter and languages of everyone seeking to join ~ time’s passing is but a gift. Each new moment becomes a brilliant path to the enlivening power of love. “I felt like I walked into heaven when I arrived at Sacha Munay. The retreat center was like the secret garden I have always dreamt of living in and the people and the food were so nourishing. 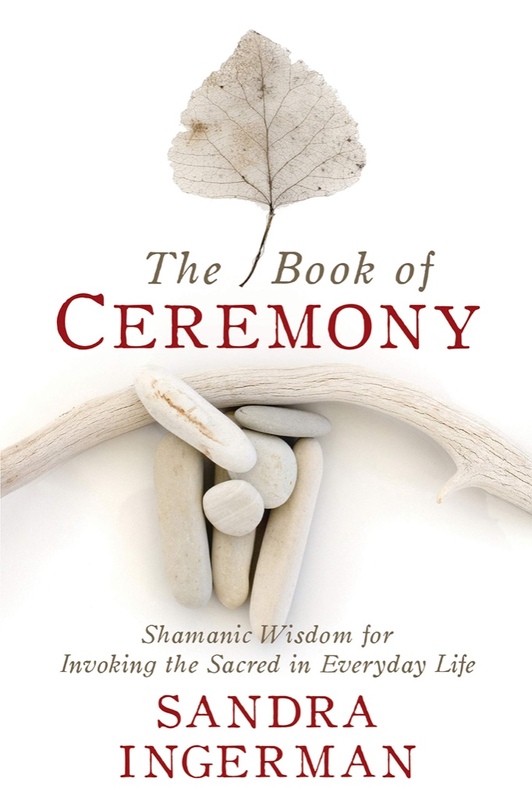 One of my favorite things that I learned from the training and that I will never forget was the Shamanic Medicine Wheel. I love how we focused each week on a different direction of the winds. 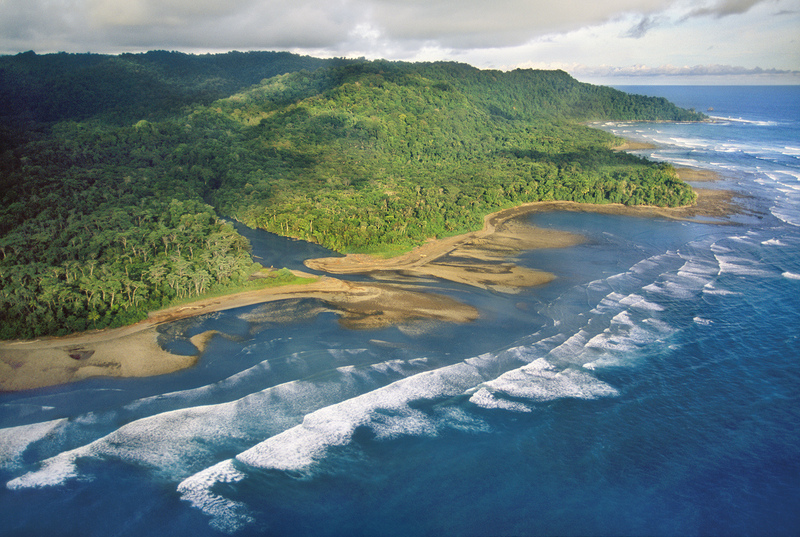 From shedding our old layers like a serpent, to facing our shadows like the jaguar, tasting the sweetness of life like the hummingbird, and then flying high into the sky to manifest our dreams like an eagle” Read more of Birttany’s heartwarming story here. 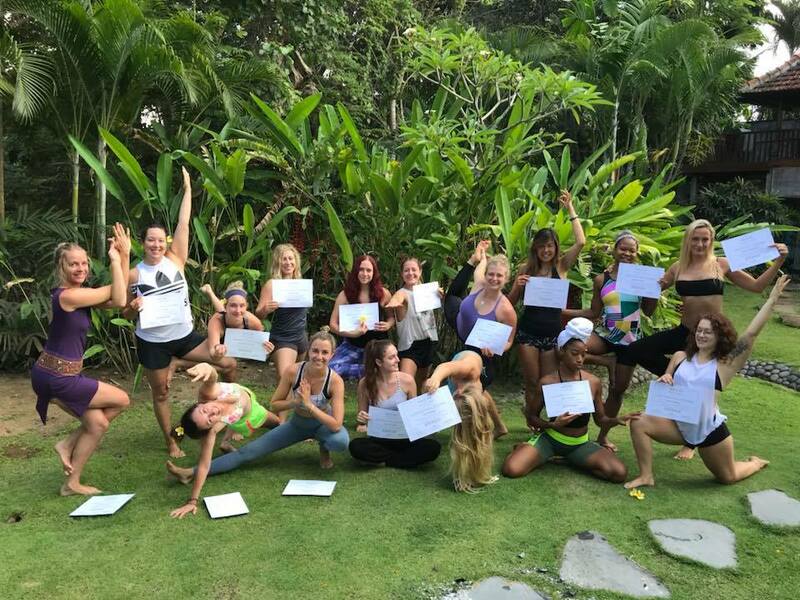 We are so grateful to have another 16 beautiful SYI yoga teachers creating wider and wider circles of healing, inclusion and change in this world! Thank you for the difference each of you make in this world! 1 Winter squash roasted for 1 hour @375 F.
Hot Peppers if you like it hot! Saute the onions and garlic in the oil for 5 minutes on medium. Add the potatoes, pepper, taco seasoning, and corn, saute another 5 minutes. Add the veggie broth. Bring to a boil, and then simmer on low for 15 minutes. Add in beans, cilantro, and tomatoes, and simmer another 10 minutes. Add salt to your taste. While it is simmering, make the smoky cashew creme. Add all ingredients to a blender and blend for 1 minute. Drizzle on top of the soup, or mix in for a creamy, smoky, delicious chili!! We look with gratitude to the night sky as October’s full moon reflects her beauty towards earth. Much like our ancestors once did, we marvel at this heavenly body and allow our minds to ponder the mysteries and vastness of the universe. Pausing for a moment in this wonderment, we invite you to sense into the connectivity of all things. Recognize that all over the globe, millions and billions of living beings are engaged in the same reflection. That what separates us is actually a tiny fragment of that which has connected us for eons past and far into the infinite future. It is not difficult to hold a tiny sleeping child and feel an outpouring of love. Observing a furry creature in the wild, it is easy to feel fondness. 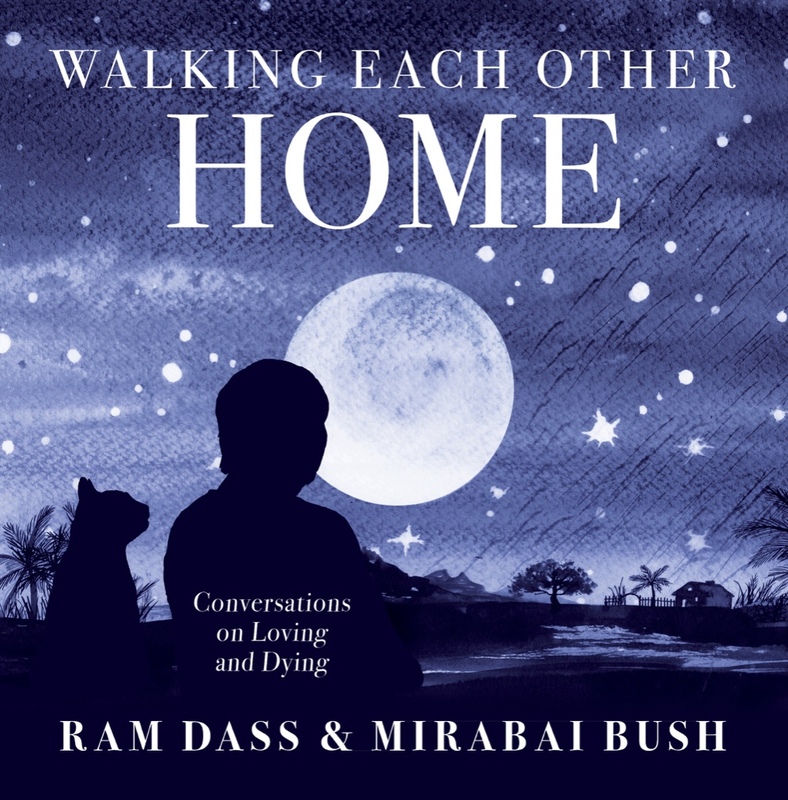 Recalling these emotions, can we extend loving-kindness to the family member from whom we feel disconnected, to a group with which we do not fully agree, to anyone we do not understand? 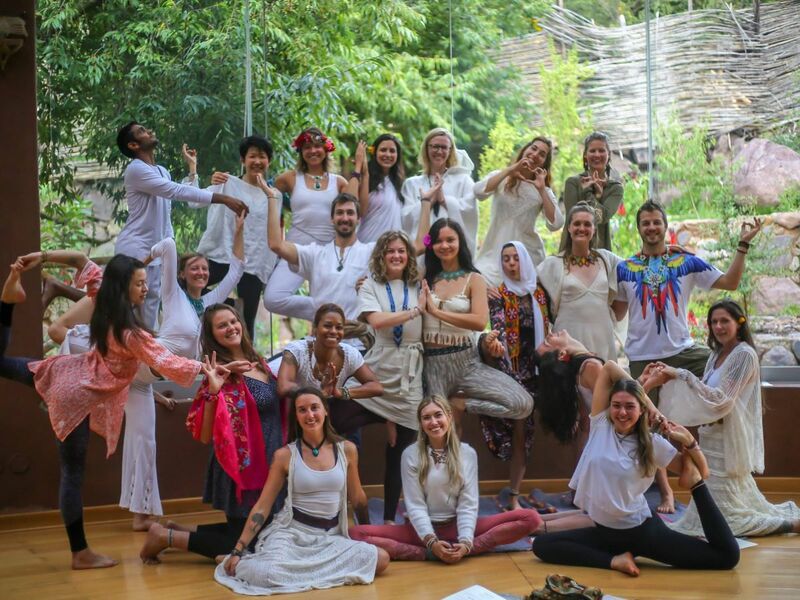 With the gifts of yoga, mindfulness, speech, and feeling, we are the collective that can enact change in this world. Inspired by our ancestors, learning from nature, and seeking deep intuition, may we each extend a helping hand. Together let us see hurt in the world and heal it. As one heart, allow us to raise up the whole and share our love with boundless generosity. “”I began looking up programs that included all the things I had an interest in and passion for. 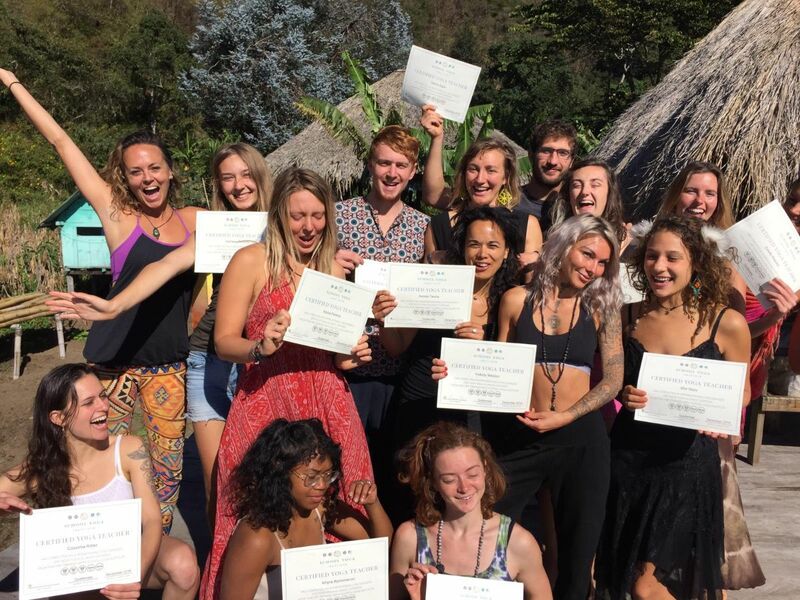 School Yoga Institute’s program caught my attention right away just based off of what the program had to offer in writing; vegan meals, an immersive nature experience on a permaculture farm in Costa Rica, a unique curriculum with strong emphasis on the medicine wheel. 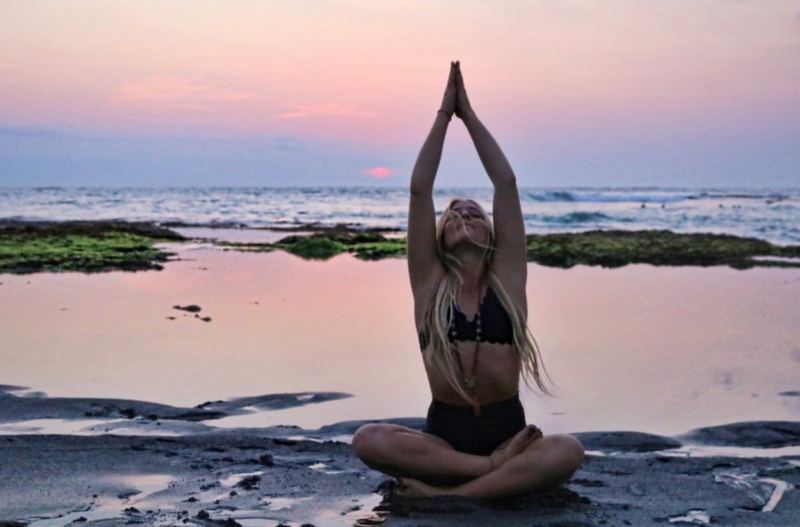 It seemed like a dream and with proper manifesting I knew it would be the perfect way to dive deeper into myself and this journey through yoga.” Read more of Kelly’s heartwarming story here. Blend all ingredients for the bounty balls in a food processor or blender. Form into balls and place on parchment paper in the freezer for 10 minutes. Meanwhile, make the chocolate dipping sauce. For Chocolate Dipping sauce: In a double boiler, place all ingredients in and stir continuously. 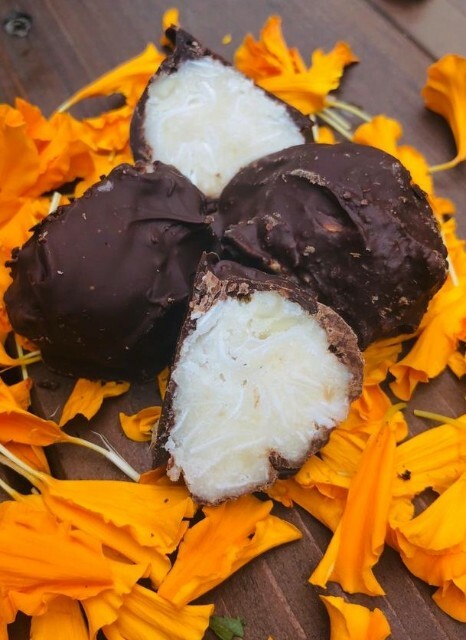 Once all is mixed into a smooth consistency, turn off double boiler, bring bounty balls out of freezer, and dip them in the chocolate!! Place in a tightly sealed container in fridge or freezer. ENJOY! !